You may want to check out my updated mini ITX NAS Build guide. Note: This post was updated in August 2013 to reflect current pricing and parts availabilty. I’ve been looking for a new machine to replacing my aging Dell Precision 360 I’m currently using as a FreeNAS server. The FreeNAS Mini from iXsystems caught my eye because of its compact design. I like the idea of a NAS box that doesn’t take up much space or consume very much power. The hardware specs on the Mini are pretty respectable too, it has plenty of power to run ZFS but still maintains a low power footprint. 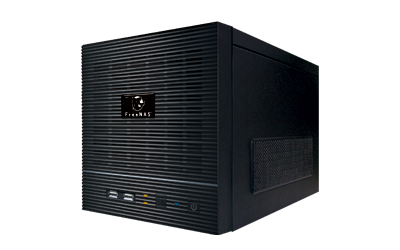 If you’re looking for a turnkey solution the FreeNAS mini is a good choice, but if your willing to build your own you can save a substantial amount of money. I decided to do some research to put together a parts list to build a NAS as similar to the FreeNAS Mini as possible. From the parts list below you can put together a high quality 4TB NAS for about $750. Below is a list of all the components you will need to build the mini NAS. Depending on what the storage requirements are for your NAS you can add additional drives, or even install smaller hard drives instead. In order to reach a capacity of 12TB you can use four 3TB Seagate Barracuda hard drives instead. John discovered that a re-branded version of the same case was available on Newegg for about $30 less than the CFI model. I was able to locate the exact same chassis that iXsystems selected for their Mini NAS, the CFI 4-Bay mini ITX chassis. 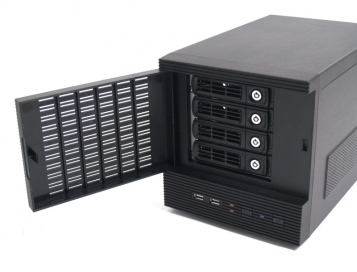 This chassis is a cube style case with 4 hot swap bays which connect to a SATA backplane. In addition there is room for another internal drive to be mounted, this is a handy feature since FreeNAS requires a separate drive for the operating system. The case comes with a 200 watt power supply which should be more than sufficient for this build. To keep things cool there is a built in 120mm fan to provide airflow without producing much noise. On the front panel there are two USB 2.0 ports, a power button, power LED, and a hard drive activity LED. The small footprint and sata backplane make this chassis a great choice for a small form factor NAS. An Intel Mini ITX media series board is the heart of this storage appliance. This motherboard utilizes the Intel H67 series chipset which supports 2nd generation core Intel core processors (socket 1155). There are a ton of features packed into this tiny motherboard making it a highly versatile board. For connecting external storage the board provides two USB 3.0 ports, four USB 2.0 ports, and an eSata port. For network connectivity there is an onboard 1GB Intel ethernet controller. The board also provides a 16x PCIe slot which could be used to add an additional ethernet card, or a wireless adapter. The Intel 2120T processor brings plenty of performance to the table yet only has a TDP of 35 watts! This 2.6GHz processor is based on the Sandy Bridge architecure and offers two physical CPU cores with 3MB of layer 3 cache. I feel much more comfortable using a Core i3 processor to run FreeNAS instead of a low power Atom chip. The ZFS filesystem is fairly CPU and memory intensive so it’s important to ensure the CPU is able to keep up without running out of power. 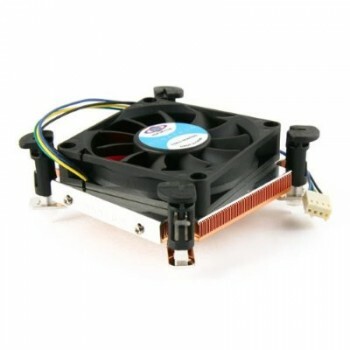 The stock heatsink / fan included with the processor is too large to fit into the chassis. Dynatron makes a nice low profile heatsink assembly with a low clearance to fit inside the chassis. Ram is another area where you want to ensure you install enough to provide fast performance. FreeNAS needs at least 4GB of memory at a minimum, 6GB is recomended for ZFS. 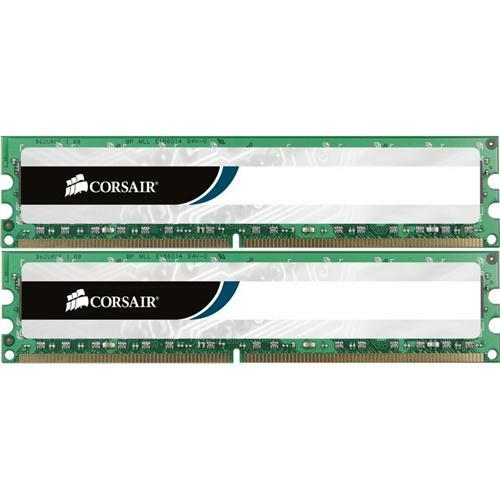 This corsair 8GB kit will provide enough memory to keep a ZFS filesystem running quickly. If you wan’t to bump up the memory to the maximum you could install two 8GB modules for a total of 16GB which is the maximum supported by the motherboard in this build. Since memory prices are pretty low right now you can actually pick up a pair of 8GB modules for less than $150. The hard drives are really the heart of any storage systems which is why I recommend installing quality hard drives. These Barracuda drives are well suited for a NAS application with their large caches and support for native command queuing. This series of drives is able to hold 1TB on a single platter, the largest model in the series (3TB) is a triple platter drive. FreeNAS requires one drive in the system be dedicated as a boot drive. Using a USB flash drive as a boot drive allows you to more drive bays for storage in the NAS. FreeNAS only requires 2GB of space for the boot drive but the drive must be a true 2GB drive or the image will not fit. 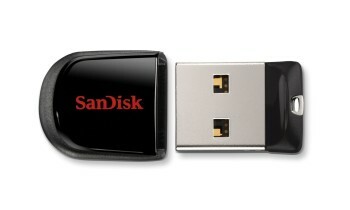 Flash drives are cheap and the cost different between a 2GB drive and an 8GB drive is almost nothing. For a more professional look you can add an internal USB header from Koutech to your NAS which allows you to connect the USB boot drive directly to the motherboard. By mounting the USB drive internally you can prevent someone from accidentally unplugging the flash drive from the NAS. 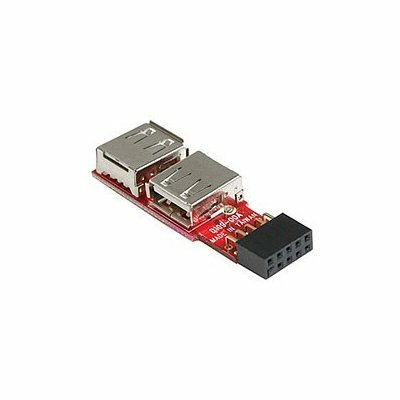 This device connects to a standard 9-pin USB header on the motherboard and provides 2 USB 2.0 ports. The ports face in alternating directions which is helpful in cases where the flash drive might otherwise not fit. 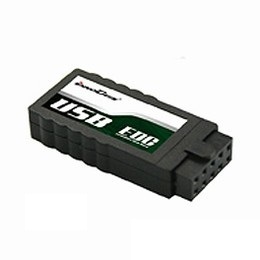 Another boot drive option is to use a USB DOM which is essentially a flash drive integrated into a USB header. A 2GB module from Memory Depot costs about $50 making it a bit more expensive than the previous option. Another downside to the DOM modules is that the size cannot be upgraded. The DOM modules are very clean and professional looking which can give your NAS a very polished look and feel. As you can see in the below it’s about $300 to $400 cheaper to build a mini NAS yourself vs purchasing one from iXsystems. If you have existing hard drives you could allocate to a NAS then you can build a bare unit and install your own drives. Building your own mini NAS has several advantages over purchasing a pre-built storage system. First of all FreeNAS provides a much greater set of features than typical NAS systems on the retail market offer. Secondly building the system yourself allows you to customize the hardware to meet the needs of your environment. In the end by building the NAS yourself you’ll end up with a much more powerful and versatile storage system. Danny, thanks for the feedback. The general consensus I’m hearing is that no one trusts the WD Green drives. It seems that the recent feedback for several of Western Digital’s products has been very poor. I’m going to remove them from the parts list and replace them with drives from another vendor. Thanks for the write up. I agree with the poster above, however, that the WD Green Drives are awful. Sure they’re cheap, but they’re slow and not designed to be used in RAID sets. Also, your 4TB system only uses two 2TB drives, and the one you’re comparing against uses 4 x 1TB drives of the 7200RPM variety (hence the bigger cost delta than the others). Just a few tips for improving this otherwise helpful breakdown! Thanks for your comments Bazzle. Based on the feedback I’ve been receiving I’m going to revise the build list and pull the WD Green Drives. The recent reviews of most products Western Digital is offering right now are surprisingly poor. You also bring up a good point about the number of drives, I’m not making a fair comparison. In practice the additional spindles will probably lead to the 4 drive unit having a better performance as well. Check back soon for some revised info. Hey Matt, thanks for the feedback. I would definitely like to include a link to the build video once it’s available. If you could post a link in the comments here, or email me directly (sam@samkear.com), I’ll add the link to the post. You’re more than welcome to link back to the article! I used a 4GB USB drive plugged into the back of the system. Your right, I neglected to include this in the parts list! USB DOM would be a much cleaner solution for the boot device. I will update the post to include this in the parts list. Sam, the mb has two sata connectors but you have 4 drives…what sata controller did you use for the other two drives? The board actually does have 4 SATA ports in total. Two of them are SATA 3G, and the other two are SATA 6G. You can connect 6G drives in the 3G ports but they will operate at 3G speeds. Most drives (non ssd) don’t saturate the bandwidth provided by a 3G port so in most cases there isn’t much benefit of 6G. If you did want to provide more 6G ports in the system you could add a PCIe controller such as the StarTech PEXESAT32. I’d be using ECC memory for a NAS box, no point having bulk storage tolerance if your running program isn’t – run away code could quite possibly spew junk across all your disks! Nice write up tho. Also managed to find the same case iXsystems use. Ultimately i’d like a mini-ITX case that had no power supply (use picoUSB module from mini-itx.com as well) and 3×2.5″ (removable) bays. Using laptop drives at <5W each means the whole system would use max. 50W and more like 20-25W when idle. Did you have any chance for actual power consumption, especially in idle mode ? Sam, can you comment on the CFI-A7879 case? …quality, HD vibration, noise, etc. I think I found the same case on NewEgg under a different name for slightly cheaper. Thanks for sharing the link! It looks like a re-branded version of the exact same case at a cheaper price. I’m sure most people would prefer Newegg’s service as opposed to Logic Supply. I’ll update the post. Fantastic tip on converting the header to an internal usb stick. I’ll use that in my next build. How in the world did you get the Heatsink/Fan in there? I mounted the HSF to the CPU/mobo but couldn’t slide the board into the case. I removed the HSF and installed the mobo to try to install the HSF after the fact, but couldn’t get it in there. Thoughts? The stock cooler won’t work. You’ll need a low profile heatsink. I just realized I left this out in my parts list. Sorry for any inconvenience this caused. Haha, it’s okay. Having built enough systems in the past, I figured that this was actually the case. (no pun intended) So I ordered up a cheapo $10 from NewEgg, but if this one is too noisy, I’ll take a look at the one you linked to. Thanks for the confirmation. Sam, I can’t thank you enough for this article. This was my first time ever building a PC and I couldn’t have done it without your inspiration. My box is up and running. I had to buy a low profile fan, and I happened to buy the same one you recommended. That’s great to hear, I’m glad your build was a success! I hope you’ll spread the word and inspire others to build their own systems too. Thanks for the article. I just finished my build. I was able to get the stock CPU heat sink wedged in there, but it was VERY tight. Spacing isn’t bad after you get it installed, but I hope I never have to remove it! I’ve heard people talking about running this with 4 NAS drives and a 2.5″ boot drive. Unless I’m missing something, I don’t see how that’s possible. Has anyone built one of these running FreeNAS under VMWare? I’d love to hear how they did it. My current thought it a 2.5″ USB3 pocket drive or a USB3 flash drive for windows. I know that this write up was intended for a FreeNAS setup, but since the chassis holds a Mini-ITX board, what are your thoughts about using this as a media center box hooked directly to a TV instead of a NAS box? I think this system would hold up well as a media center PC. I would probably add a dedicated PCIe graphics card for better hardware video rendering, but everything else should be up to the task. The hardware specs exceed the recommended requirements for Plex which is what I would use. If you decide to give it a try please update us with your results. Excellent write up! thank you so much for spending the time to put this together and to update it! 1) You mentioned that: “there is room for another internal drive to be mounted, this is a handy feature since FreeNAS requires a separate drive for the operating system.” Since you’re booting from a USB flash drive, could that 5th drive be still installed and made part of the RAID to increase the total storage capacity? regarding my second bullet… it seems that nowadays CPU’s and heat sinks come with the thermal compound past already prepped on them. so all you have to do is mount everything together and you’re ready to go. FYI everyone… this mini ITX case comes only with two SATA cables, so if you’re planning on sliding in 4 drives… it seems like you’ll need to buy extra two cables. what’s puzzling to me is that on the recommended motherboard there are only two 6Gps internal SATA ports and the other two are 3Gps. that can’t be good for a FreeNAS ZFS Raid setup. This project looks excelent, unfortunatelly the mobo has been discontinue in several places, do you have any other suggestions, I have also read in other sites people using ASUS mobos like the ASUS E35M1-I DELUXE, unfortunatelly also discontinue, I like your aproach of a low power mobo CPU. I think the next best option is to step up to the Intel BOXDH77DF motherboard. 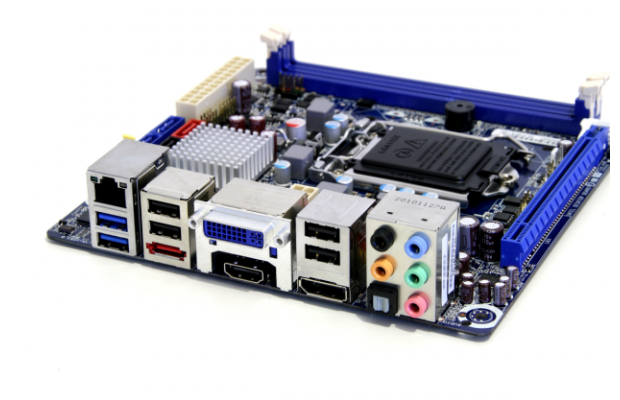 This board uses the newer H77 chipset which supports both Sandy Bridge and Ivy Bridge processors. The features are very comparable to the discontinued board in general. The nice thing about Intel boards is they almost always include on-board Intel network ports which are supported very well in FreeBSD. I’m working on an updated FreeNAS build with Ivy Bridge chips which I hope to complete soon, I’ll post details when it’s complete. I’m in the process of building a very similar FreeNAS box. 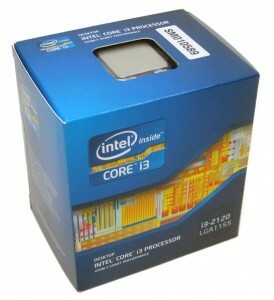 I ordered the Intel Desktop Motherboard BOXDH77DF. It appears to be the current version of the board Sam used. I went with the i3-3220T processor. I agree, the BOXDH77DF is the best replacement option. I was actually just typing my response to Jorge when I noticed your comment. I’m glad to see with both came to the same conclusion! Looking in for the MOBO you and Garrett suggested, I came across the Gigabyte LGA 1155 DDR3 1600 Intel H77 HDMI SATA 6Gb/s USB 3.0 Mini ITX Motherboard GA-H77N-WIFI. I know you like the included network port of the intel motherboard. This one comes with two, plus WI-FI. I think you can also use the BX80637i33220T CPU. What do you think? Thanks you very much for the suggestions. Sam, I’m looking forward for your updated build. One more thing the chassis has also become hard to find, but I found it at http://www.directron.com/csci03.html on sale for $129. Thanks in advance; I hope my links can be useful. Amazing post, Sam! I used your build as a foundation for mine (built in December 2012). This was the first computer that I have ever built, so I am still learning and your tutorial was priceless. I wanted to build a server for my media as well as a demo server for the software I sell. I would LOVE to install a liquid cooled system, but I am not sure which direction to go (getting some temperature warnings). Any ideas? Kill-a-Watt has my system running at 50 watts. I am looking for a better way to cool my case as it is in my closet and seems to be running a little hot. I am interested in any option (cost does not matter). I am worried that I will not have the clearance to add a liquid cooled system. Should I change the direction of the air flow to exhaust the air? I took the side panels off the chassis and that has seemed to help…but it is obviously not ideal. Have you completed an updated build that you mention above? Many of these parts are discontinued now. Even the updated intel motherboard you list is backordered in most places. I use this case in a RAID-5 NAS. 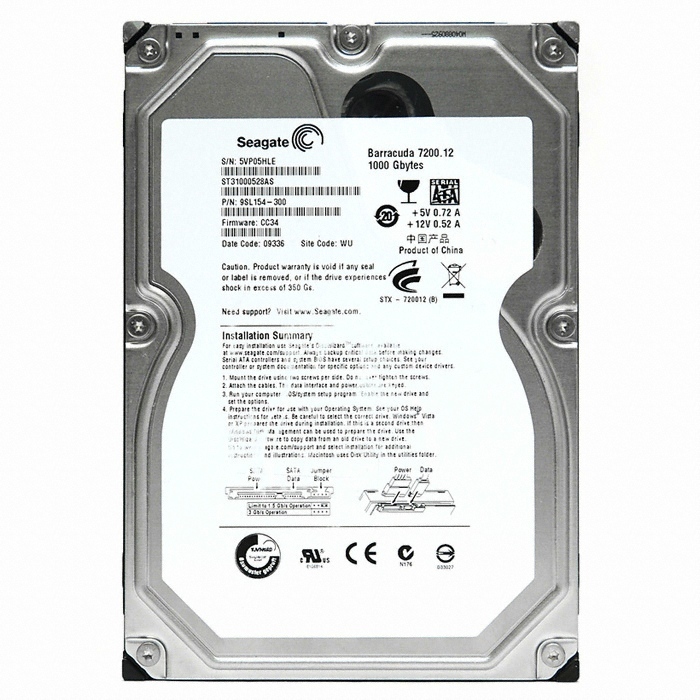 I find the case does not provide adequate cooling when 3.5 inch HDD are used; the drives alway “run very warm” and the review of the iXsystems FreeNAS mentions that. I have added an additional fan between the power supply and the front of the case blowing across the HDD and that knocked off a degree or 2. I have removed side covers also, but that creates “safety issues”. I had thought about doing hardware modifications to the case with metal snips to create holes then cover the holes with those wire-type fan grills. Ultimately I replaced all of my 3.5 inch HDD in this case with 2.5 inch laptop HDD; 750G WD Black. These drives run pretty cool. Basically this case needs to be redesigned to improve airflow. The SATA backplane blocks all airflow in that direction. The power supply blocks almost all airflow in that direction. That leaves the other side of the HDD cage for airflow. The HDD cage metalwork could be reduced by 1-3 millimeters along the rails to improve airflow. A 120mm case fan mounted on the front door with some of the drive door plastic removed would help drive air into the HDD cage. The tool-less HDD drive bay carriers could have their front grilles opened up more. The sides of the case could be opened up more…lots more. In other words, beware using this case for extended periods of time with 3.5 inch HDD, and definitely watch the HDD drive temps as reported in S.M.A.R.T. I am not sure if FreeNAS can report HDD drive temps as I don’t use FreeNAS. I have always thought that heat can reduce the operating lifetime of HDD; I just wish I had data to back up my thoughts. Thanks for the excellent post. I’m just about to start building a NAS with this enclosure, but wanted to add a SSD 2.5″ boot drive. Unfortunately this case doesn’t seem to come with any instructions. Does anyone on this forum know where the 2.5″ drive is supposed to be mounted internally? I have several ReadyNAS units and really enjoyed this post. While I’ve not built my own, I am no stranger to white boxes, but have relied on tier 1 products for many years now, so my building experience is very old these days. Anyway, I really did enjoy this article and the user comments, but the purpose for this comment is just to say that for every link I opened each one I attempted to open in a new tab (or window) and each one the main page also changed! I’ve never seen that before, but I had to keep hitting back after looking at a link. I did something similar – same box, but mini ITX mainboard with integrated dual core AMD (~90 USD), 4 GB RAM and 8GB industrial DOM (~20 USD). Currently have 2 disks 4 TB WD red with normal Linux (e.g. no Free NAS). Price without disks is ~280 USD. 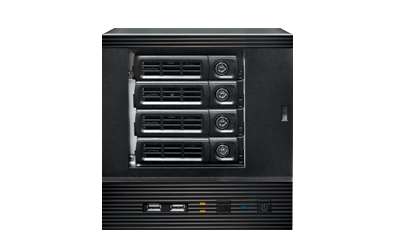 could you please make an update and make a follow up of the new FreeNAS Mini – http://www.ixsystems.com/storage/freenas/? I really would like to know precisely what components they’ve used (Case, MB, CPU, NICs, RAM). Does anyone know? Thanks. > they’ve used (Case, MB, CPU, NICs, RAM). Does anyone know? Thanks. I also would be intersted in this. I run this configuration with 4x3TB Seagate Barracuda. And as #39 indicated: the temperature within this case is definitely too high for the disks. I already had two disks dying before I realized the issue. Is there enough space for cards on the motherboard? I need a 10Gbit nic and an LSI Raid controller. This board only has a single 16x PCIe expansion slot so you wouldn’t have room for both cards. If you need two expansion slots in a small form factor your best option would be to use a micro ATX motherboard, which would require a different chassis too. Mini DTX motherboards will fit into a mini ITX cases with two slots (like the Fractal Design Node 304) but there are very few mini DTX boards available. You might also want to check out my newer FreeNAS build guide.